SEGUIN, Texas - Internal records obtained by the KSAT 12 Defenders confirm that officials with the Seguin Police Department created a fake police credential for a radio executive last year. The documents, handed over this month following a series of open records requests, include a copy of the credential listing J.R. Schumann as the department's SWAT commander, commissioned by the Seguin Police Department as a full-time peace officer in the state of Texas. The credential includes a picture of Schumann, Seguin PD's badge and the seal for the state of Texas. 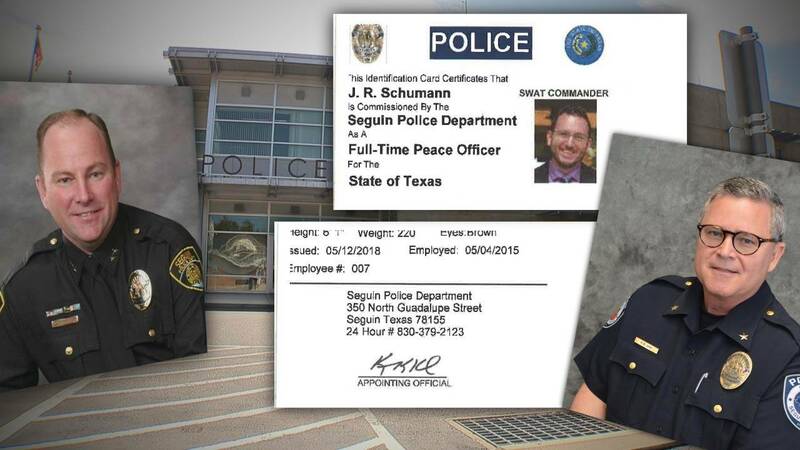 Records from the Texas Commission on Law Enforcement, however, indicate Schumann, a radio executive, has never worked as a commissioned peace officer in the state. Email records show the idea had been in the works since as early as October 2017, when then-Deputy Chief Bruce Ure told a city administrative technician he had been authorized by then-Chief Kevin Kelso to have the credential made for an International Association of Chiefs of Police conference in Florida. Records indicate the credential even included an employment date for Schumann of May 2015. Kelso downplayed the incident when reached by telephone last week, claiming his signature on the back of Schumann's credential was taken from a pre-filled form. "Didn't have a role, bud," Kelso said. "It was just a joke." The Defenders left a voicemail for Ure last week requesting comment. Ure instead responded via email, claiming the ID was going to be used in a joke that never took place. Ure inaccurately said it was his own picture on the ID. Schumann himself confirmed this month that the photo used on the ID was of him and taken off of his leadership coaching website. Schumann said via email this month that he was unaware the credential existed and even though he was with Kelso and Ure in Florida around the time of the October 2018 conference, he did not attend it. Schumann provided evidence of his whereabouts while the conference, which featured a speech from President Donald Trump, took place. Email records show Ure apologized for the credential two days before he moved up his retirement date and left the department. "Sorry to have caused some inconvenience over this," Ure said via email on Nov. 3, adding that he had destroyed the credential and it had never left his suitcase. Kelso himself left the department days after Ure's retirement. A separation agreement released Monday to the Defenders confirms Kelso was given a severance package that included three months' salary and the paying out of nearly 300 hours of accrued leave time. The severance agreement also served to settle any possible claims or causes of actions between the city and Kelso. Seguin officials have for months been tight-lipped about the overhaul of its police department, which included the retirement of Ure and the resignations of Kelso and Capt. Victor Pacheco. A city spokeswoman declined to comment for this story, calling it a personnel matter.